So every year for Christmas Day, we go to visit the boyfriend’s family for dinner — and they have vegetarians in their family, so I take along my own veggie main dish. For the last few years I’ve taken along a veggie nut loaf, but this year felt like doing something a little different. After all of the savoury pies and tarts I’ve done this year (like the Nettle Tart or the Woolton Pie), I thought a mushroom pie would go down well. And after my first try and great success with puff pastry (Garlic Scape Puff Pastry Pizzas, anyone? 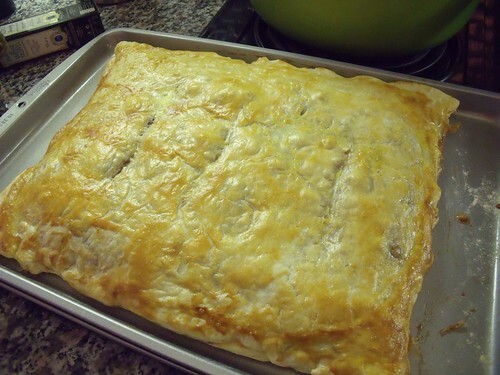 ), it needed to have a puff pastry lid. 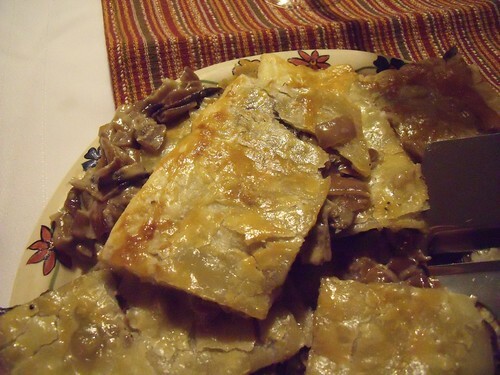 After some investigations online, I came up with something a little different: a stand-alone rectangular pie made with two sheets of puff pastry encasing thyme-y mushrooms and onions. Mmm. Of course, something so delicious must be a Nigel Slater recipe, and I figured it was ok to splurge on the puff pastry and crème fraiche in this one, as it’s the holidays after all. Ohhhh I am so glad I just stuck to the recipe for this one. If you have any vegetarians coming over, they’ll be happy for this pie for sure… and it was much more happily devoured by the omnivores in the family than my usual nut loaf! And yes, it still goes well with the traditional Christmas sides: cranberry sauce, cheesy & garlicky mashed potatoes, and roasted squash (this year I did roasted red kuri squash [aka. kari squash] with pomegranate and sesame seeds instead of the butternut). Yum. In a large pan over low heat, melt the butter and add the onions. Cook for about 20 minutes, until the onions are completely soft. Add the mushrooms and bring the heat up to medium. Cook for about 5 minutes more, until the onions are cooked through. Add the thyme, crème fraiche, and salt & pepper. Let cook for 2-3 minutes more, until the mixture has thickened slightly and is no longer runny. Lay out one sheet of the puff pastry (or roll into 2 rectangles, approximately 35 x 20 cm). Spread the mushrooms/onion mixture over top, keeping it away from a 2-3cm (3/4-1″) border around the edge. Using a pastry brush, brush some of the beaten egg around the border. Lay the second sheet of puff pastry over top of the first, and squeeze the border edge together to seal tightly, being careful not to leave any open edges where filling could escape. 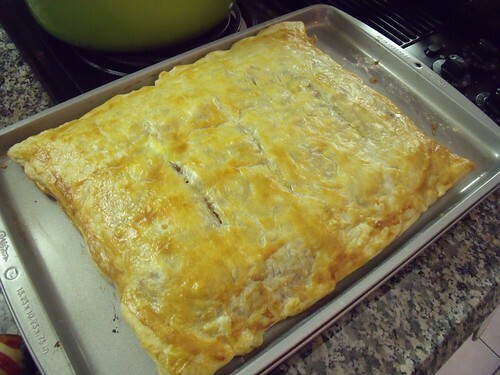 Brush the top of the puff pastry with the remainder of the beaten egg, then cut a few slits in the top of the pastry. Bake at 400F for 25 minutes, until the pastry has puffed up and becomes golden. Serve warm from the oven and enjoy the decadence! Dear lord that looks good!! We’re making it when we get home!! Any time, let me know how it goes!!!! I haven’t tried it, but I think it would freeze really well. I’d reheat in the oven, from frozen.